Doors opened at 3 PM but most ticket holders had gathered in the parking lots to get ready for the big show with friends and cold ones, and by the time the show was set to begin, spirits were high all around. 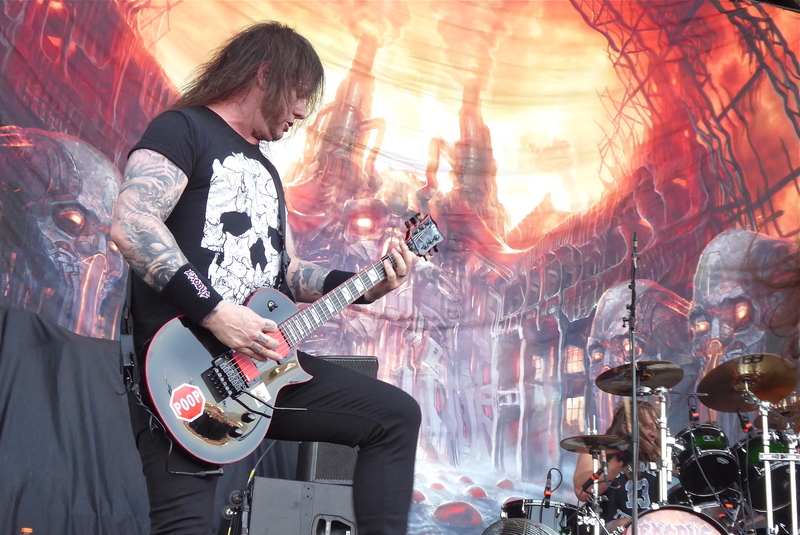 A few minutes past 5 PM, Exodus hit the stage, and after sound issues during the opening song wherein the vocals were inaudible, they got into their groove and played a typically fierce set. Their song selection was just about perfect for the amount of time allotted to them and for the purpose they were here to serve, and they certainly proved themselves to be an ideal opening act in this setting (something that cannot be said for the next two bands that took the stage). 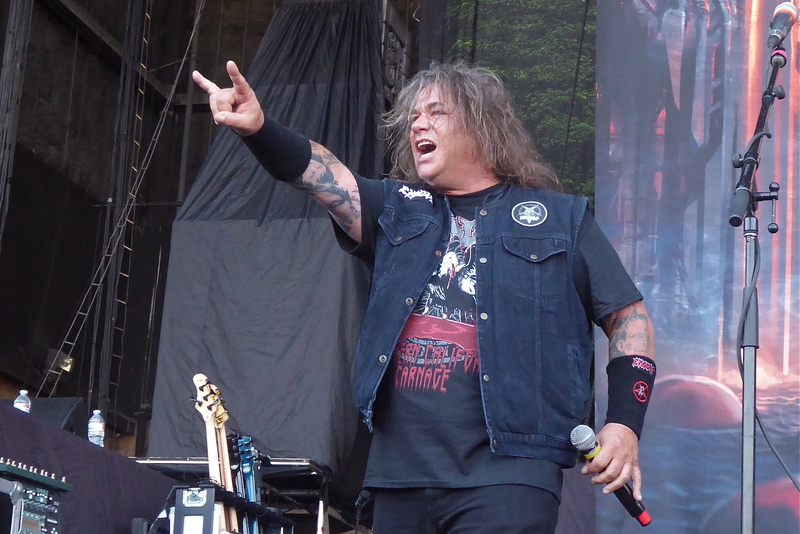 Exodus brought forth good energy, put in a solid performance, and singer Steve ‘Zetro’ Souza successfully got the crowd involved and excited. Going strong since the early ’80s, the Exodus machine keeps running and shows no signs of relenting. 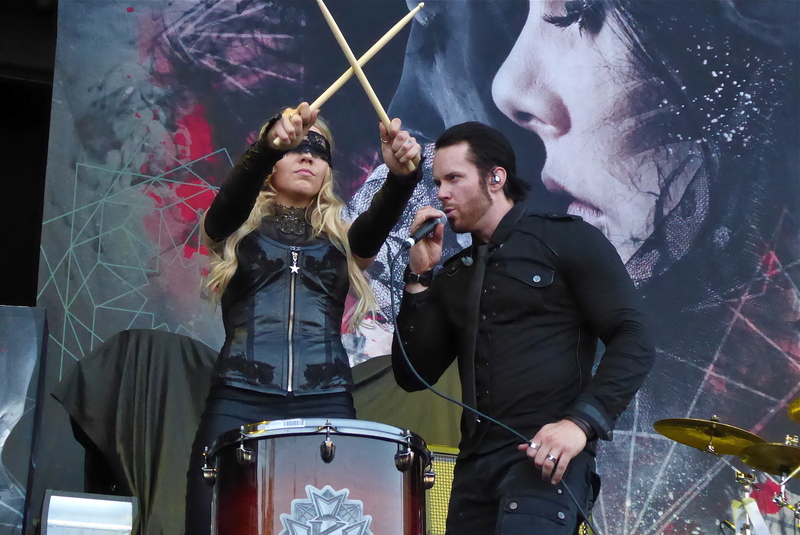 Next up was American/German/Swedish power/symphonic metal band Kamelot, appearing with their core 5-piece lineup plus Kobra Paige (Kobra and the Lotus) and Lauren Hart (Once Human) as guest vocalists. 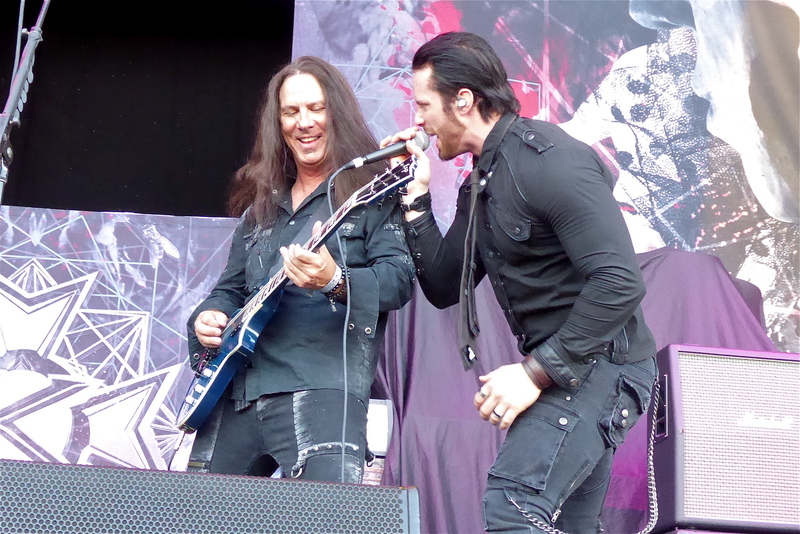 Kamelot is a well-established act, having been in existence since ’91, but the general consensus at this event was that the crowd was only familiar with two support acts, Ghost and Exodus. 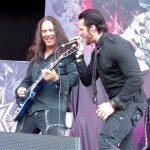 So, this was a great (and well deserved) opportunity for Kamelot to make a lot of new fans with a one-off appearance. But sadly that was not to be the case. 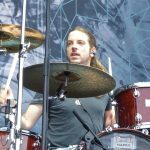 They suffered from major sound problems, as lead singer Tommy Karevik’s vocals were extremely low in the mix and kept cutting out through the entire set, to the extent that most of the audience completely lost interest in anything this band was doing on stage. 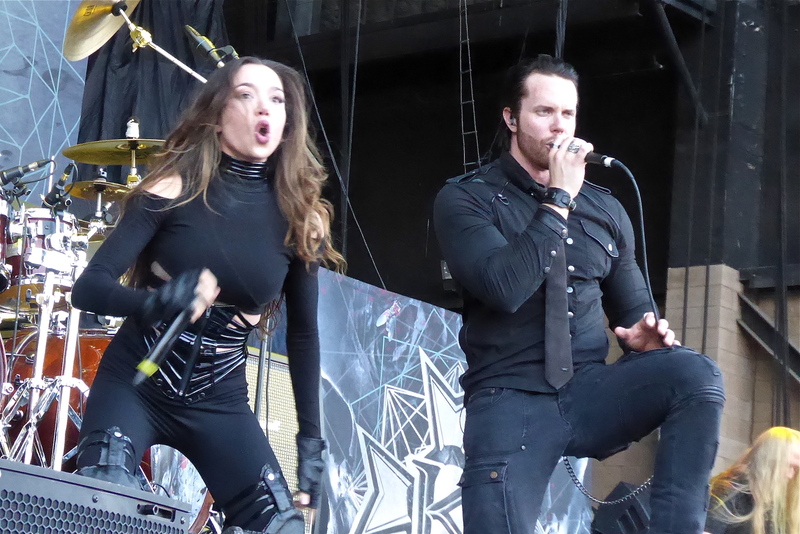 Kamelot is absolutely not a band to see outdoors in bright sunlight, so it was an odd choice to have them on this show to begin with, and then the pathetic state of their front-of-house sound gave them no chance whatsoever to make an impression. It was a real pity, and whoever was responsible for the sound should be embarrassed, to say the least. 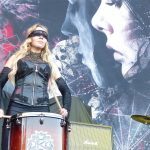 Kamelot is a great band, so if you were at this show and caught their set, we recommend you to not judge them based on this ill-timed, terrible-sounding set, and to go see them on their 2018 North American tour instead. Main support act Ghost took the stage at 7:30. 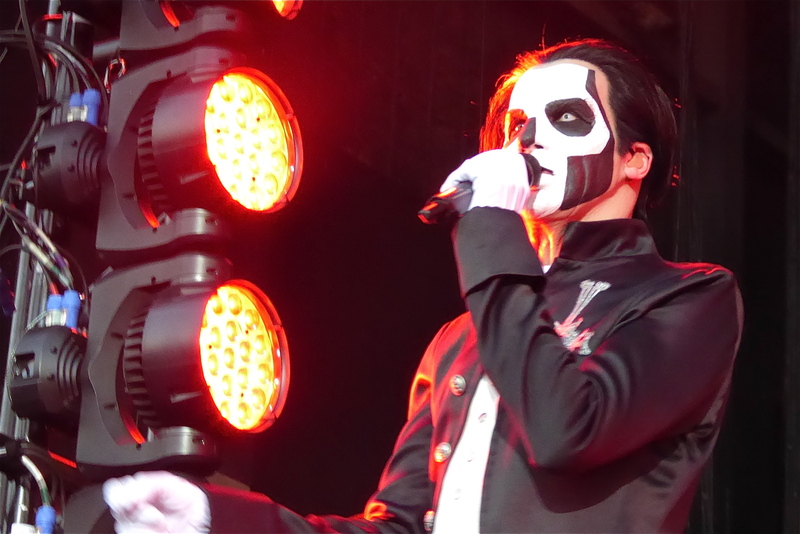 This band polarizes the metal fraternity into two groups, fans and haters, with not much of a middle ground, and this was evident here at Glen Helen Amphitheater. 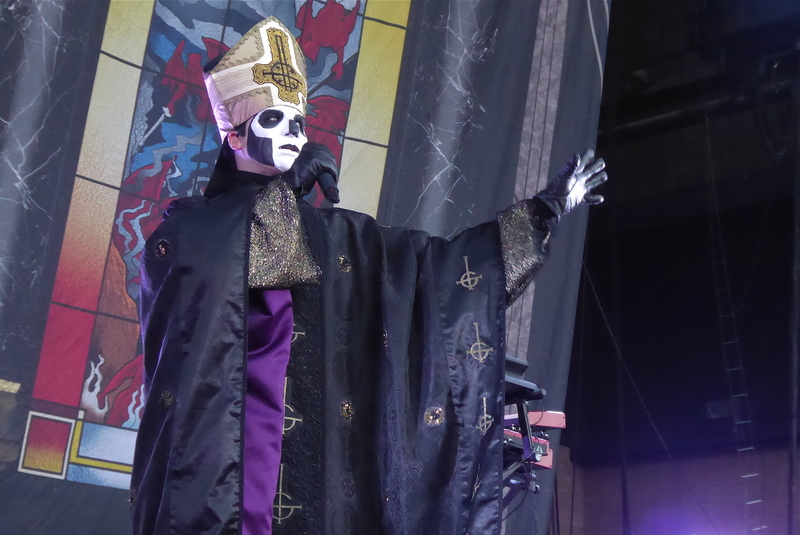 For quite a few people in attendance, Ghost was as much of a reason to buy a ticket as Iron Maiden, but for others, this was a welcome break to use the restroom, buy merch, food or drinks without standing in long lines, or to take a nap if you were lucky enough. 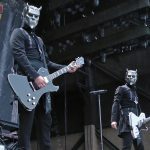 In all fairness, just like Kamelot, Ghost is also not a band to experience outdoors in daylight, and has most likely been making a stronger impact opening for Maiden in other cities where the shows have taken place in indoor venues. 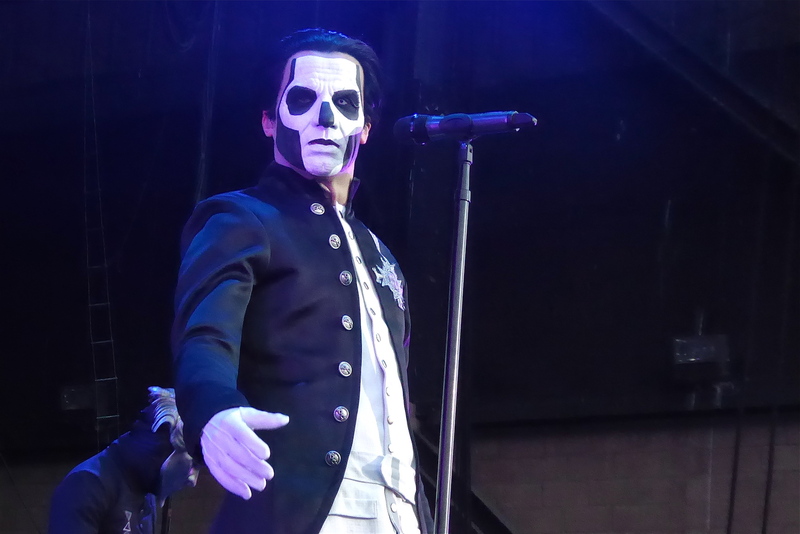 But even then, one couldn’t imagine it being all that much better, as Ghost’s monotonic music and ultra low-energy on-stage demeanor comes as starkly contrasting to that of the high-flying, galloping headline act, and the singer’s mega-awkward stage banter does not help their cause either. 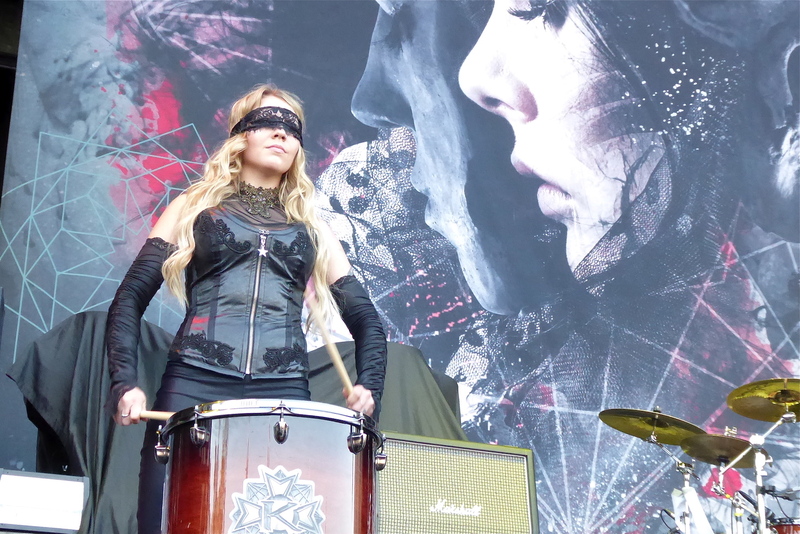 It is incredibly amazing for a supposedly theatrical band to be this boring. They used to be a great live band, but that was only on their first album cycle, and they have certainly spiraled downward fast into the abyss, as they been rather forgettable and bland since then. 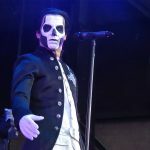 Readers of this site would know that none of us at Metal Assault are elitists, and we cover plenty of bands that are borderline metal, but in all honesty, absolutely nothing about Ghost resonates with the metal genre. 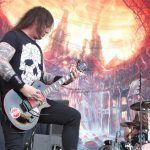 They looked and sounded completely out of place here, and for their own sake and the sake of metalheads worldwide, they should say goodbye to the metal world forever and take their snooze-inducing circus elsewhere. As the clock neared 9, the gathering at Glen Helen collectively held its breath in anticipation of something special. For this audience, after purchasing the tickets several months in advance, all the pre-show planning, that painfully long and strenuous drive to get to this venue, the blazing sun, the dent in the wallets from premium-priced refreshments, and the lackluster opening acts … it had all come down to this, and it was all going to be worth the effort. The familiar pre-intro of UFO’s ‘Doctor Doctor’ rang loud and clear on the P.A., which is when you know you’re almost there. The crowd sang along to the words of this classic, then the lights went out, and as ‘The Book of Souls’ intro video was played on the screens, time came to a standstill. The excitement was beyond palpable and jubilation was imminent. 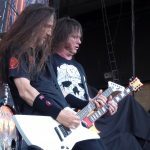 Glen Helen Amphitheater exploded in collective elation as Iron Maiden arrived on stage at 9 PM, to begin a two-hour set with which they reconquered San Bernardino all over again and went on to prove just why they are still the undisputed Numero Uno in the world of heavy metal. 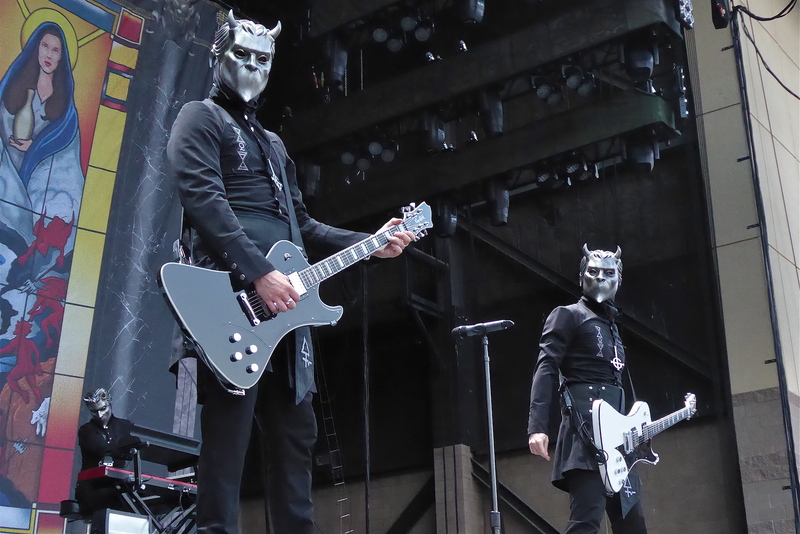 With this show being part of the same touring cycle in which they visited Los Angeles for two nights at the Forum in 2016, the set list was not going to be much different, as it made sense to present a similar show for those that had missed the LA gigs last year. 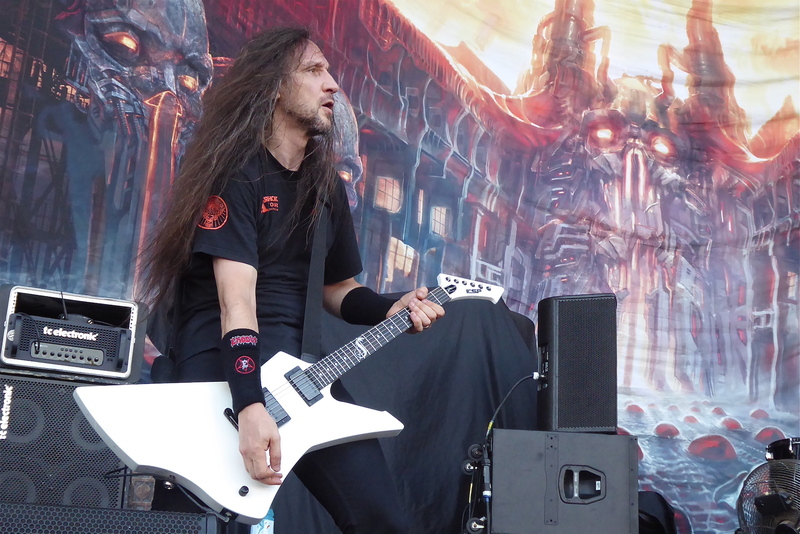 But Iron Maiden always change up the set list a little when visiting the same territory on different legs of a tour, and sure enough, they made two changes from last year. 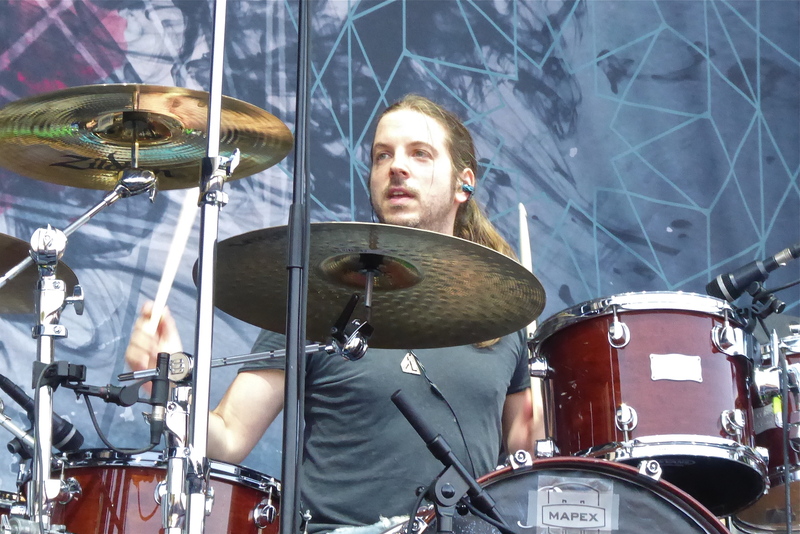 All can agree that this was an even better experience of ‘The Book Of Souls’ show than the one in 2016, perhaps as the band is far more comfortable playing these songs now, and also because fans have had more time to digest the new material. 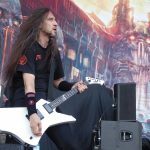 For a band like Iron Maiden, it is impossible to release a new album that does not get compared to their own great work of the past, and of all bands, they have the largest number of truly great albums. 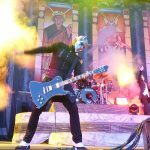 So, ‘The Book Of Souls’ naturally falls short in that comparison in the ears of many fans, but upon experiencing these songs live, everyone realizes that this is indeed one of the finest albums of this band’s career and combining immaculate musicianship with a grand stage setup and unmatchable theatrical elements, the songs off of ‘The Book Of Souls’ make for an undeniably epic live show. But of course, if you go to any Iron Maiden concert you are treated to a healthy dosage of classics, and this show lived up to their reputation in that sense as well, with at least one song from each of the first 6 albums, one from the reunion era (outside of ‘The Book Of Souls’), and the staple crowd-favorite, ‘Fear of the Dark’. 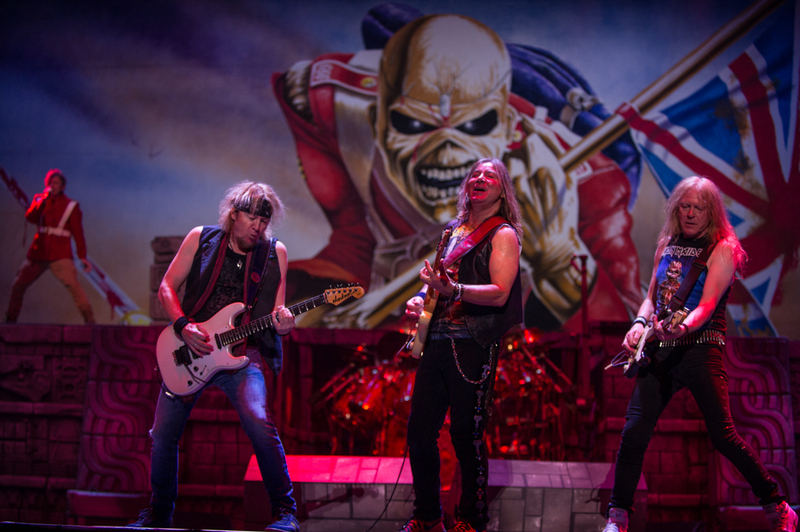 The stage backdrops were switched out to represent the respective albums, Bruce Dickinson changed costumes whenever necessary, the pyrotechnics kicked in when appropriate, the mascot Eddie made his appearance, and it was a sight to behold as the entire show ran like clockwork. 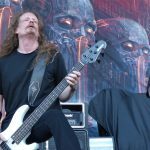 Dickinson ripping Eddie’s heart out and throwing it into the crowd during the rendition of ‘The Book of Souls’ title track is as metal as it gets. 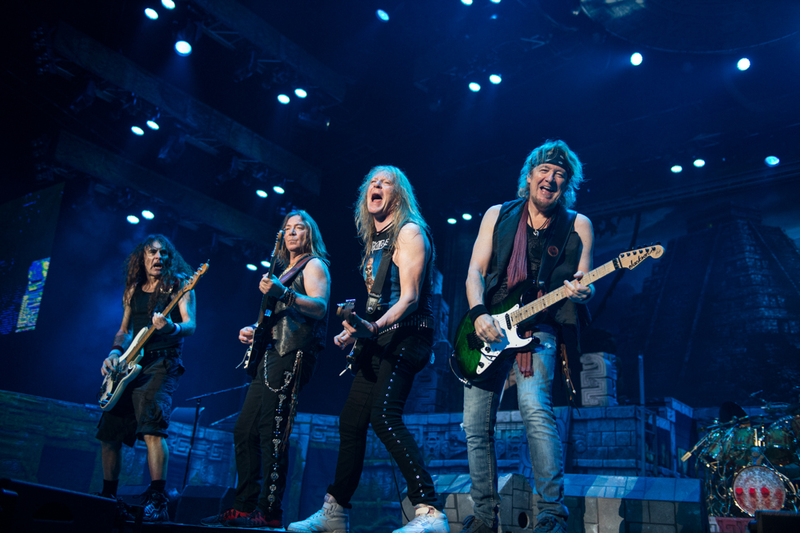 As you’re basking in the glory of everything this band is doing on stage, you realize and re-realize that absolutely nothing compares to an Iron Maiden show, and that is why they are the greatest band on earth. 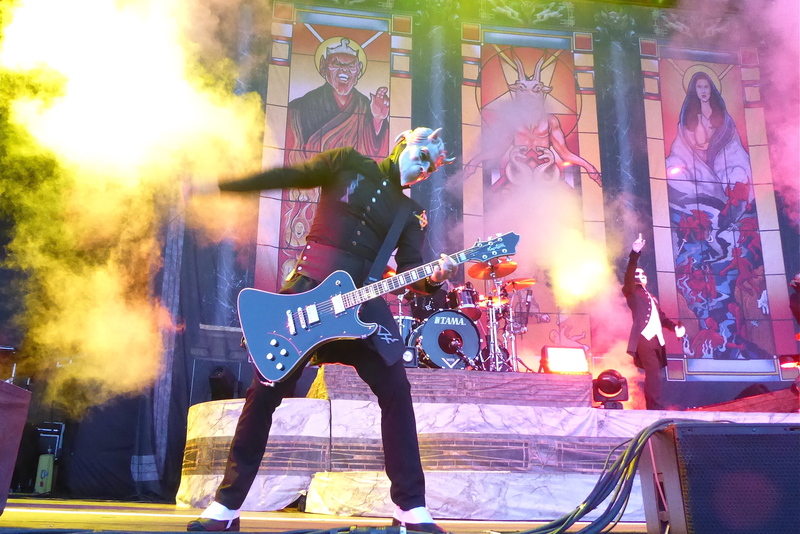 Visuals and theatrics aside, what really makes this band so legendary is sheer musicianship, which only seems to get better even as they get on in years. 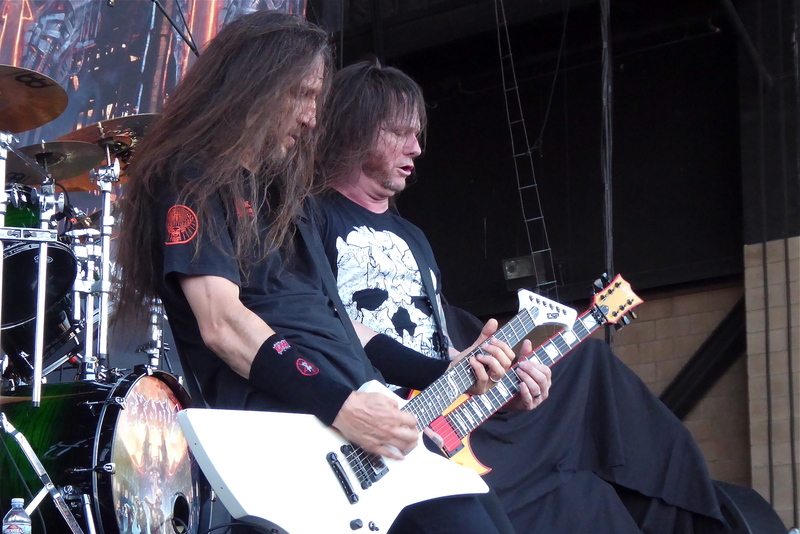 Iron Maiden is the Benjamin Button of heavy metal, a band that looks and sounds younger as it gets older. 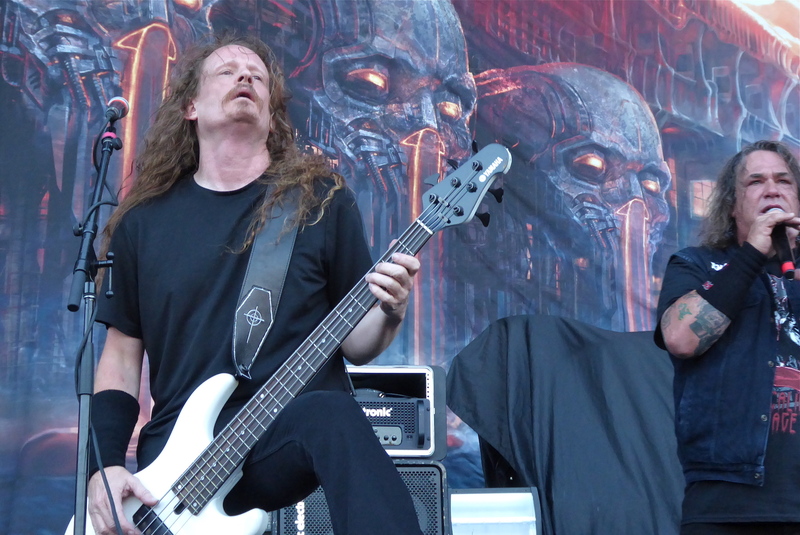 Beyond vindicating fans for the undying loyal support, the top-notch quality of an Iron Maiden show is also a slap in the face to half-assed bands that are given the old man pass for sounding mediocre in their latter years. Bruce Dickinson is at the peak of his powers as a vocalist, performer and frontman, as are his five band mates in their respective roles. This San Bernardino crowd sang along to every word of every song, and was all ears whenever Dickinson engaged in his instantly enjoyable banter. 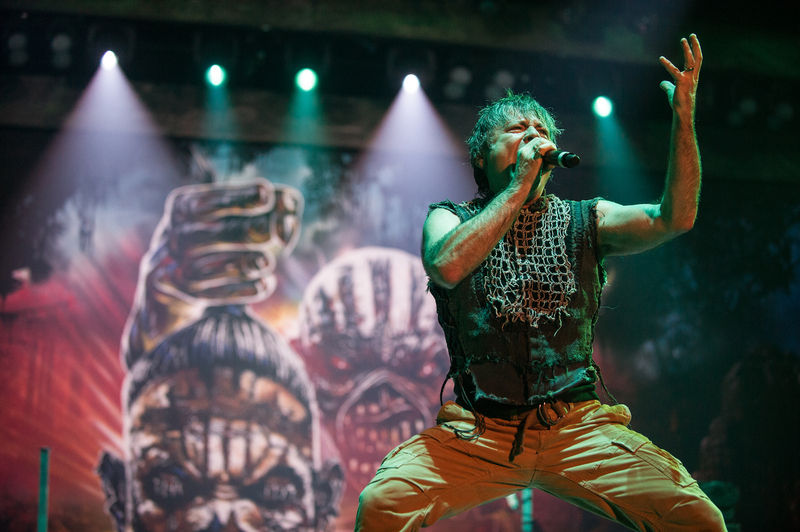 From the front row of the pit, to the orchestra and loge seats and all the way to the very back of the lawn, Iron Maiden held the crowd in captivity and induced passion, emotion and ecstasy in every fan, in a manner only they can. 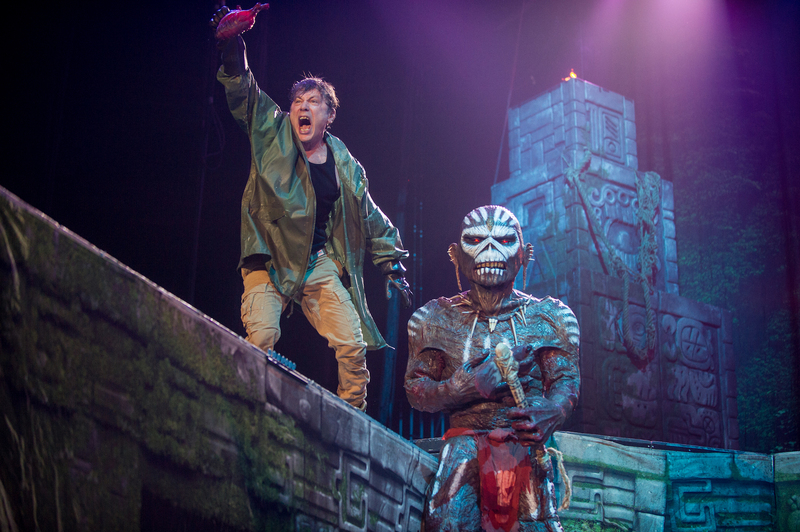 This show of theirs on ‘The Book of Souls’ world tour is compelling evidence of the notion that in the world of heavy metal, Iron Maiden still reigns supreme, and wherever you are, no matter how far, Iron Maiden is gonna get all of you.